Some business owners have seen the cheaper inkjet printer and been sucked in by the price. However, there are distinct reasons that a laser printer will make more sense. In terms of speed, longevity and precision, a laser printer will give you better office equipment. Another little-known fact is that laser printers also require less upkeep than what you receive with a standard copier. Because toner cartridges hold more toner and use less for each document, you will save more in the long run. Looking to reduce the amount of toner cartridges that you have to change? 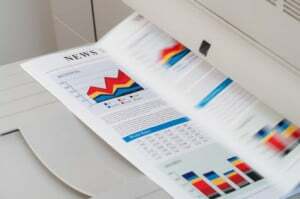 With an inkjet, you cannot rely on such a system to print a high volume. Your business productivity relies on your printer, so you want one that will give you the best, and we always recommend laser printers to our customers. While an inkjet printer does offer a higher quality with image printing, laser printers have always offered superior text-based printing. Finally, a laser printer offers greater speeds than an inkjet. Especially in a business setting, you will often need speed to print the things that you need, and a laser printer can help.